You came to our house last week, on the day after Christmas, and put our little cat Lucy to sleep. I wanted to thank you for how incredibly sensitive you were. I am sure you see pet owners who are terribly sad all the time, but thank you so much for respecting our sadness, and, more importantly, for giving our little Lucy her welcome escape. I think my daughter, in the end, felt like she had done her best for her cat, and you were an important part of that. I also want to acknowledge how professional you were, although that word tends to sound cold. Perhaps it's more accurate to say that we truly felt that we were in good hands. I just wanted you to know that we received Arlo's paw print and your lovely card. We love the paw print -- thank you! I cannot thank you enough for your care and understanding during your visit last weekend. We know we called on just the right person to help him. We are now adjusting to a house and a life without Arlo, but we feel at peace with the time and the way that he left us. Thank you so much again for coming to us. I hope this message finds you well. This is Sara. 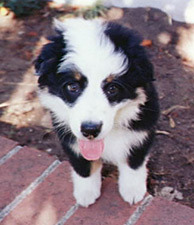 I visited Southern California Veterinary Hospital in Woodland Hills many times with my cat, Sam. You may have remembered him as a feisty, clever black cat who I swear could be sweet at home. I had brought him in numerous times for treatment for his IBD/possible lymphoma and for dental issues. 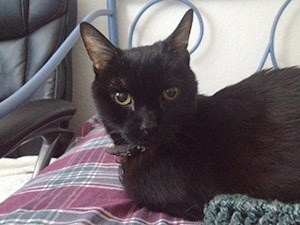 You helped pull him through his illness when many others whom I spoke with said that it was very unlikely that a cat with his symptoms would pull through, and for that I am so very grateful. In 2014, I moved to Seattle with Sam, and he continued to do well up until a few months ago. I wanted to write to you today to let you know that over 3 1/2 years after his initial diagnosis, Sam finally passed away this afternoon, humanely euthanized at home after his progressive lymphoma had reached a point where it was clear he was no longer comfortable. 3 1/2 years, and I am certain that he never would have made it were it not for the care he received early on. Thank you so much for all the advice and care. I feel like I had a wonderful second chance with Sam that I wouldn't have otherwise had. I see on your site that there are wonderful testimonials about the caring & loving way in which you helped people with their last moments with their pet. I, too, have had a loving experience with my last moments with Sammy, under your care. However, it must be said that you are equally wonderful with healthy pets who have a long life ahead of them. You've been my vet for Sammy and Molly for many years and I couldn't be happier with the care you provide. I often regale people with the description of how you ask me to spread the towel on the floor, then let the pets come to you. They think you are petting them because they're in their own home, but, unbeknownst to them you're examining them. Over the years, the two veterinary assistants you've brought with you have been great and obviously, animal lovers too. I love the caring, loving veterinary care you provide not to mention the expertise you bring. Even if you didn't provide in-home care, I would not consider ever letting anyone else tend to my precious little creatures. Thank you for all you do and are. I wanted to thank you for making the transition for Bailey so peaceful and comfortable for all of us. When I think about my last hour with Bailey, I have only peaceful, calm memories and know he is in a much more comfortable place. Your kind, quiet words and manner were so comforting for both of us. The most difficult moments in our lives were handled with grace and dignity. I had been anticipating that time for a year or so, even more in the past months, and couldn't imagine that i would be able to face that time with such peace. Thank you for your loving care, your kindness, your calmness. It meant the world to all of us. You are truly an angel. Thank you also for Bailey's plaster paw print. It made me smile and I will treasure it always. Sorry it has taken so long for me to write this but it has, as you probably already know, been difficult. I just wanted to thank you so much for giving Mika and me a beautiful and caring time. If something so difficult and hurtful on the living can be beautiful then you gave that to us. I will always miss my Mika and little soul mate but am trying to cope just knowing she is not hurting. Again, please know that I can recognize how difficult your giving is but I feel the need to tell you that you touched me and family greatly. Thank you. I wanted to take a moment to thank you once again for helping me, Karen and Lou last week in one of our saddest hours. Lou was very special to us, and we were caught somewhat by surprise by the fact that he took such a sudden downward turn. As hard as it has been to lose him, we're thankful that you responded to me so quickly, and that you arranged to come to our home on a moment's notice. You helped ease the pain of one of our worst days, and I take some comfort in knowing that the end came peacefully and painlessly for our little Lou. Incidentally, the crematory delivered Lou's remains to us on Monday. They were very understanding and compassionate as well, and seem to understand that the people they are dealing with are grieving. That was very important to us. I will review your website for the other services that you provide, and keep you in mind for helping us take care of our friend Rocky. Thank you once again for being there, and for your kindness. 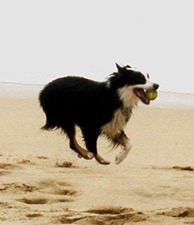 My family and I who were present during the last moments of the 13 years that we had our dear Bode in our lives want to thank you for the compassionate and professional manner in which you were able to guide us all through that difficult time. Today, his ashes and paw print arrived - exactly when you said they would - bringing another tear to our eyes. It isn't easy and we will miss him forever, but it was the right thing to do and he passed so peacefully. He will never be replaced, but another dog or cats might be added to our lives in the future and I would certainly consider having you as their full-time Vet based on how you cared for Bode and us during this tough time. Dr. Kelly came to our home on a Sunday morning, on very short notice to help our 16 year old cat Tigger make the transition. She was sensitive and caring toward my husband and me, gentle and loving to Tigger, and completely professional. As difficult as this experience was for us, Karen transformed it into what I can only describe as beautiful and peaceful. It was as if an angel had been sent to us in our time of deepest grief. 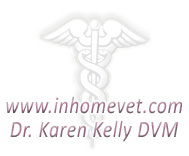 I cannot recommend her highly enough, for veterinary needs in general, but particularly for her extraordinary in-home service.